One of the least favourite aspects of episode 1 was its poor grasp of Sonic physics. It worked, sure, and on its own terms it was a perfectly competent platformer, but a good Sonic experience has a beautiful flow and sense of momentum to it. Episode 1's physics had much more of a literal way about them - Sonic pretty much only moved when you moved him deliberately with the thumbstick - release it and he tends to stop dead, so jumping felt weird and you can completely forget about rolling Sonic gracefully down a slope and watching him pick up speed all by himself. For episode 2, the PR people made sure to highlight that such concerns were being addressed and that we would see some significant improvements. Tweaks are definitely noticeable but as I suspected, it's not exactly a complete recovery. You don't have to play too far into it before you realise Sonic moves around in a much more familiar way now. 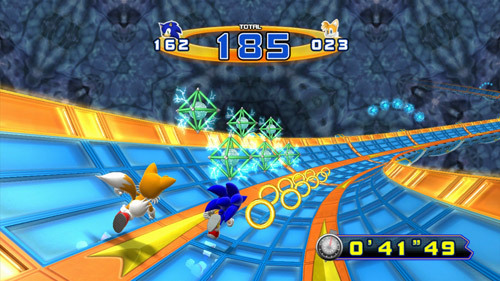 Spin dash, release and then jump without holding forward and you'll find Sonic whips through the air and lands on the ground in the kind of neat arc you would like to see - rather than witnessing the untimely and immediate death of your speed as soon as you've pressed jump. 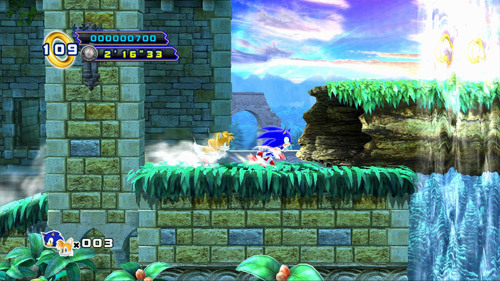 Sonic even spins faster depending on his speed, just like in the originals. It's not pixel for pixel with the classics, but it feels like a happy medium between them and episode 1 that I think most people will find satisfactory. You'll also, quite rightly, have much more trouble walking up curved vertical walls this time too. Jumping around is fine, but rolling still feels a bit off. It's hard to say, as I'm no expert on the exact maths behind what Sonic should be doing in any given situation, but I can't help but feel he should be rolling down slopes at a choppier pace than what he's doing at the moment. I think it probably has been improved from episode 1, and there is speed gained by rolling down a slope, but not much of it and it has to be quite steep. Most of the levels are designed in such a way that this isn't always particularly an issue, but in speedy sections of Sylvania Castle and particularly in the rollercoasters of White Park Act 2, you'll feel like you should be going faster. Frustratingly, the spin dash appears to be exactly as weak and disappointing as in episode 1, the developers having apparently not played Sonic Generations, which boasts a classic spin dash that is so quick and convenient that it will take your thumb off if you're not careful. I must admit, I kind of miss being able to just hold and release X for a quick boost. Sorry purists - it's wrong, yet it feels so right. The New and Improved Powers of Team Work! Lets not forget one of episode 2's USPs - Tails! Firmly happy being back in Sonic's shadow, he tags along, picking up the extra ring as ever he could. He can also now open items, pass checkpoints and acquire shields and power-ups along with you. The X button (on the 360) can now be used to summon him instantly and perform one of two team work attacks depending on whether or not you happen to be in mid-air at the time. Jump and press X to have him carry you while flying. It's a similar control set up to Sonic 3, just press A to gain a boost up, however this boost is a bit more powerful so it requires careful practise, and as well as being limited by time as you always have been, it now appears that Tails can only go to a certain height too. You have to press X to release yourself, and will often have to use this move in order to reach a boss, so then quickly pressing A to home in on them is tricky. Press X while on the ground to initiate the controversial double spin move where Sonic and Tails join in a manner that cannot be comfortable, in order to batter their way through walls and obstacles at a generally quicker pace. This tends to go on and on in one direction until you press X to break out of it. I ponder that they may have dumbed down the spin dash and the roll on purpose in order to make way for this move, though it's an awkward substitute. Still, these moves go some way, I suppose, to add a bit of variety without straying too far away from the tried and tested classic formula - plus there's an occasional power-up that allows you to perform an action not unlike Sonic Heroes' Team Blast. It was a while before I managed to stop forgetting that they were there at all though, much to my peril in Oil Desert Act 3's scary sand crushing segments, as the handy panels that help spell out which one you need to use start to disappear further into the game. A bigger gripe though is that I was constantly calling up the wrong one by just getting my timing wrong as to whether or not I was pressing X while on the ground. I think perhaps they should have had separate buttons. Sonic 4 Episode 2: Attack of the Clones? High on the list of big let downs in episode 1, and a personal favourite complaint of mine, was that it simply wasn't original enough, relying instead on what I like to call "level clones"; levels that are obviously based very heavily on one particular other level from a previous game, in terms of appearance, structure and objects (the patented Zone: 0 "three magic factors"). It's done in the hope that people will say "Yay! Green Hill Zone! Casino Night Zone! Just like I remember them", but really most of us say "Oh for God's sake, if I see another Green Hill style level I'm going to ram a palm tree into Ken Balough's moustachioed cake hole". I can speak for myself only but I think a lot of people share my opinion, that I don't need to be reminded of classic levels, I play them all the time. I need to be entertained by new ones, with their own original concepts and features. They don't necessarily have to be entirely new types of places or an entirely new trope, just a set of ideas, maybe some new, some old but from a variety of sources, that identify them uniquely from any other level. That's what I had my hopes held high for with this game, especially when we were told that only one stage took its cues from a previous one. The fact that this is, as it turns out, a blatant lie is infuriating, but it does at least offer me the justification to use the highly appropriate Star Wars pun that heads up this section. 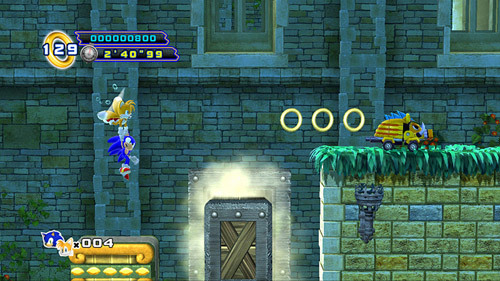 Naturally, this one level could only be the first level, Sylvania Castle, an Aquatic Ruins inspired clone that, satisfyingly enough doesn't actually feel that much like the Sonic 2 source material, even though it borrows almost everything from it. Perhaps I'm a more simple creature than I would have liked to think that I am, because it could be that all it takes is just a simple shift from daytime to (beautifully done) morning and night time, and a slight tweak from ancient ruins to more castle-based ruins to get me to be more accepting of this particular clone. It dips in and out of numerous but fairly shallow water pools by way of loops and curved roads with a mixture of new badniks and old, and features borrowed from Aquatic Ruin, as well as Marble Garden, and some simple new rotating and moving platforms in Act 3. The floating spring that needs to be flipped with a homing attack is a nice new touch though. In terms of the difficulty of this level, I was curious as to whether they'd treat it as a first level to a new game, or a fifth level to an existing game, as it's technically both. It has a similar problem that Mushroom Hill Zone had - to be straightforward enough for new users to complete, but challenging enough to conceivably be placed in the middle of a larger game, and it actually tackles the problem very similarly. It is straightforward to complete, but has a larger range of unique objects and structural features than you would normally expect to find in a first level, much like Mushroom Hill. The next two levels were most exciting of all - finally levels that actually have some individuality to them, and not obviously based on one particular predecessor. Probably my favourite is the second level, White Park, as unimaginatively named as it is (come on people, Christmas Carnival Zone surely!). It's a beautiful cross-breed of two Sonic staples, the snow level and the carnival level, and alternates its emphasis on each from act to act. 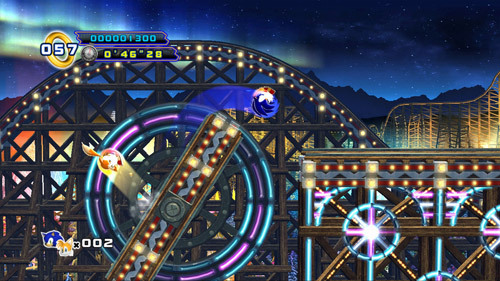 Act 1 is a catchy, festive frolic with all the trimmings, whereas Act 2 sees Sonic and Tails take to the rollercoasters and avoid being crushed by lots of huge moving pieces of track. Act 3 is mostly submerged in the chilly waters where you'll probably find your first real challenges of the game, particularly towards the end, where seal badniks that freeze the water into impenetrable spheres create a very tricky trap. Although annoying, it's a nicely done idea that sees enemies interacting in their environment very well. A great zone. Oil Desert is the type of locale that I've actually seen more than once or twice in fan games, but it's never quite been done in an official game. 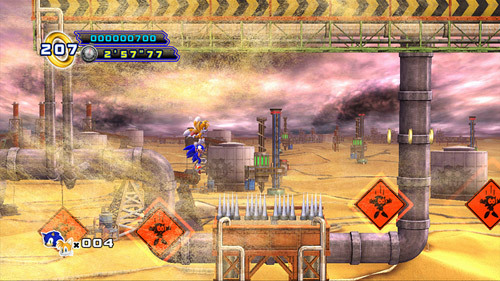 It takes place on Eggman's oil mining operation (presumably one of the sources of his apparently unlimited funds) in the middle of the harsh, windy desert. Sand storms blow you across the gantries and rigs and new badniks such as the dung beetle and flame throwers that set oil slicks alight prove annoying, though nonetheless kind of welcome for the sake of originality. In terms of other objects, you'll find many nods to Oil Ocean and Sandopolis in particular, including oil slides and quicksand in Act 2. 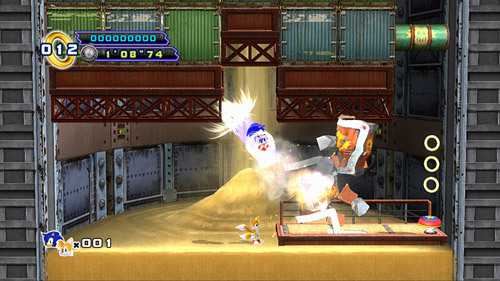 If you thought the rising sand segments of Sandopolis were tough though, wait until you see what Act 3 has to offer you. It took me ages before I remembered that I had my new team moves to help me through it, but it was at this point in particular that switching between them became a noticeably fiddly and frustrating process. As is now customary for any new Sonic platformer, there comes a point during the time between announcement and release that I lay low for a while, by turning off Twitter and avoiding Sonic news sites in the hope of keeping my eyes and ears away from the spoilers of every single level that will inevitably emerge, either from hackers or SEGA themselves. As such, I managed to keep away from anything to do with the final level until I reached it myself in the game. Imagine.. a completely brand new level, with brand new ideas that I was about to experience all at once. A lovely and rare Sonic moment if ever there was one. I was excited. What could it be?.. Well, I'll tell you what it is.. I can't tell you how annoyed I was. The fourth level is not one but two clones in one neat little disappointing package. The first act of Sky Fortress (well, at least its highly original name is masking its true origins) is a more frustrating version of Sky Chase Zone, and the other two acts are Wing Fortress with a pinch of Death Egg and little else. They're all well and good as levels, and Act 3 at sunset feels very climactic and everything, not to mention beautiful, but it's just such a wasted opportunity. Make a flying fortresss level by all means - in fairness we haven't actually had one for ages - but at least try to do something different with it. Even a different colour scheme for the ship would be something. Fortunately we're not quite done yet, as there is an additional semi-level as part of the final bosses, which sees Sonic and Tails take another trip up into space to discover exactly what Eggman has been up to with Little Planet. It actually unites the stories of all of the classic games quite nicely, albeit with little complexity. This is nothing very groundbreaking, but at least it doesn't look exactly like anything else. 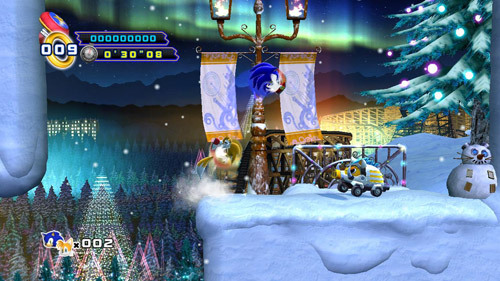 I can't help but think a really cool level could have been made by blending the wacky world of Little Planet with its new mechanical outer shell though, and it's disappointing that although quite epic and exciting, Sonic essentially retraces incredibly familiar steps in the last quarter or so of the game. One thing you can say about this game is that it is definitely a challenge. More so than the first episode and in fact, more so than most Sonic games of recent years. And in general, it's the right kind of challenge too, which is a very good thing. There are death drops sure, there always are, but the level design mostly doesn't rely on precarious platforms balanced above them, awaiting any small mistake at any point in the level. It feels cheap if this keeps happening, but like the classic games, episode 2 restricts its biggest platforming challenges to very specific points in the levels, creating potentially terrifying areas that you may lose strings of lives on and may get frustrated with, but there is a kind of mutual understanding there. You get the rules, you understand why you're messing up as you gradually figure out what you have to do and how to do it. This is how it should be, and in fact makes these levels perfect candidates for Zone: 0 guides (though don't get too excited, I probably won't be writing them). It also makes the game feel longer than it would be otherwise, and therefore gives it a bit more value for money. That said, most of the acts have a very healthy length to them anyway, taking anything from 2 to 5 minutes after a couple of goes, potentially much longer on your first try. It's hard to say having only played each act no more than a handful of times, but the downside of these impressive lengths appears to be that the all-important factor of multiple routes may have been sacrificed, as I haven't spotted too many other entrances and exits to alternate paths in most of the acts. One addition to longevity is the inclusion of our new friends, the red star rings, and there's one tucked away somewhere in each act. Although I haven't picked up a lot of these yet, I have at least seen quite a few of them, and I figure that if there were lots of other routes to take, the level designers would hide them on those that are less well-trodden. It's not a big deal right now but multiple routes are the real key to 2D longevity, and I fear their absence will have a big impact on this aspect of the game. Bosses are invariably the most frustrating bits in the main game though, and this instalment is no exception, with some real tough cookies. 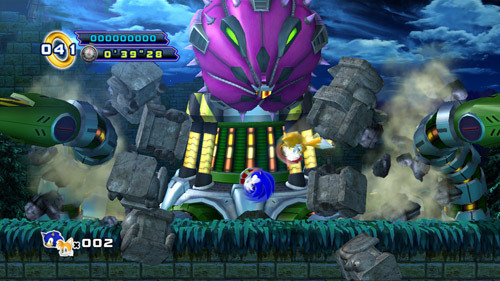 You will face Eggman and Metal Sonic alternately at the back end of each zone, and gone are the little Egg-mobile attachments, to be replaced by larger machines that require lots of hits and lots of time. A shame really, I do think the smaller scale boss is something that 2D games should hang on to. Thankfully though, they are at least entirely free of cloning and pretty much completely original, illustrated not too subtly by having the stack of spitting statues from the Aquatic Ruin boss rise up from the ground in the first battle, only to be knocked away by mechanical vines almost immediately. The final boss is particularly unique, yet also, particularly frustrating. Lastly, we can't forget the Special Stage, which takes its cues, as most others always have done in some way, from the Sonic 2 half pipe. Another feeling of deja vu. It does at least offer a chance to make some much needed refinements to that classic formula however, namely to do with Tails. You remember, he used to walk straight into bombs and lose your rings, making the whole thing, well, pretty pointless, and actually probably one of my least favourite Special Stages. He's much better behaved this time, moving more in time with Sonic, and even when he gets hit I don't think he loses rings, though I may be wrong. I'm only about half way through my emerald collecting challenge at the moment - a bit stuck on the fourth emerald - but early indications show that this hunt for the shiny jewels is as tough as it ever was. I can only hope that one day we'll see the "collect blue spheres" Special Stage make a much needed return, if any more cloning must be done. Next stop on the up and down rollercoaster ride that is this review is the musical stylings of Jun Senoue. Now once again he appears to have been given the sole task of coming up with the entire soundtrack for this game, which actually is quite big, and I do think he could have used a hand with it as it might have ensured a more consistent and higher quality. The bottom line is that it's much the same story as in episode 1; lots of unique pieces of Mega Drive style music, some maybe a little bit catchy (albeit "growers"), others seem to lack any sort of memorable tune whatsoever. Sylvania Castle Act 1 is definitely a baffling example of the latter, which seems to get itself all keyed up but never goes anywhere interesting whatsoever, while White Park Act 1 by contrast has a much more defined, pleasant melody. Strangely Oil Desert and Sky Fortress abandon the Sonic 4 rule of having completely different tunes for each act and instead go the traditional route by handing out variations of the same tune for two or all of their acts - perhaps Jun ran out of either tunes, time, or both. I wouldn't really say any of them jumped out at me as immediate favourites, and I don't think I'll be distributing too many iTunes 5 star ratings, but it's perhaps not as much of a melodic disaster as the first few pieces of music in the game would make you think it would turn out to be. What is a bit more of a train wreck though is the general quality of them. I really don't think he's got the hang of this retro sound that he's going for, because many pieces are difficult to like just because they sound instrumentally repetitive (yes, he loves that annoying Sonic 1 and 2 drum sound), awkward and just plain uncomfortable to listen to. Oil Desert Act 3 and even the slightly re-done Sonic 4 title theme, along with several others, are really not easy on the ears. I'm no musical expert, but I know what I like to hear, and there's just no sign of the kind of beautiful complexity heard in the likes of Sonic 3 and Knuckles, and you get the impression that he doesn't quite understand that just because it's retro, it doesn't give him an excuse to make music that sounds awful. I appreciate he was probably under a lot of pressure to get them all done, because good quality or not they still take time, but most of his recent work in general hasn't entirely impressed me to be honest, as I felt he had some of the weakest offerings on the Sonic Generations soundtrack too. I wouldn't be all too sad to see him step down from his current role as all-important Sonic music guy in favour of someone more capable, such as Tomoya Ohtani. Sorry Jun. Do you have Sonic 4: Episode 1? Do you have Sonic 4: Episode 2 on the same system? Wouldn't it be nice if you could connect them together, or "lock on", if you will, to create the complete Sonic 4 experience? It would wouldn't it? Oh well, moving on..
Well, I assumed that probably wouldn't be happening, given the changes to physics and graphical styles etc, but as it turns out, it probably would have been possible, because if you have both episodes, you can unlock a bonus level called "Episode Metal", in which you play as Metal Sonic in one act of each of the levels in episode 1. These acts are edited heavily to create more of a "hard mode" experience, and demonstrate how Metal Sonic got his groove back, discovered some sort of secret glowing purple power source in Lost Labyrinth, and stole Tails' little space rocket thing in order to catch up with the duo in time for episode 2. It ties up a few (albeit not really that crucial or interesting) loose ends and offers a nice new challenge on existing content. However the key thing here is that Metal Sonic controls exactly like Sonic does in episode 2. i.e. we have episode 2 physics in episode 1 and you can really feel the difference. I can't imagine it's going to take a gargantuan amount of work to import the rest of the acts, albeit with any necessary object placement tweaks, so that we can have that full continuous experience and make episode 1's content that little bit more enjoyable. Future DLC? Maybe if we ask really really nicely but my personal suspicion is that now that it's done, sadly, SEGA will just draw a line under Sonic 4 and move on. A safer bet is that one day a clever hacker will come up with something and who knows, maybe more clever people will be able to soften all the hard edges and shape a complete Sonic 4 into a more refined and smooth, fan-assisted package. Worst Episode Ever?.. Nah, not really.. I've been a bit hard on the game in some places, and even though it took me on a bit of an emotional journey, I did enjoy it, and would recommend it. It's well constructed, has genuine challenge, and the new graphics engine looks beautiful, particularly the lighting effects and the vivid, busy backgrounds. Control over Sonic, while not perfect, has improved subtly yet significantly, and moving him around feels as solid and smooth as I would want. Aspects of the level design could be better; they still rely too much on existing ideas rather than new ones, and I genuinely don't know if that's down to the misguided view that we want loads of throwbacks, or just simply a lack of new ideas. The latter isn't entirely true because there are new little touches, in both episodes for that matter, but most of the new obstacles and features in this game are fairly simple platforming ideas. It's also a shame that there doesn't appear to be a great emphasis on exploring multiple routes - a key ingredient of classic Sonic that I'm still not confident that they entirely understand. I feel that they were barking up the wrong tree with the musical direction all along, and this is a shame, as it too impacts greatly on how much you want to go back and experience these levels. That said, what I really took away from this is that, at least in part, this felt like a truly new 2D Sonic experience, the likes of which I haven't enjoyed in quite the same way in years and years. Say, Sonic Advance 3, or possibly even earlier, because everything since has either felt like it's been designed in an entirely new, faster style that, while entertaining in its own right, is not the same, or in the case of episode 1 or Generations, feels too close to existing material to really feel unique and unexplored. This episode, even if just relatively briefly, captures that feeling of exploring bright, imaginative and varied worlds that are new, exciting and distinct from each other in every way. You're not forced along them at breakneck speed, the pace is comfortable and individual, and each act has its own specific challenges to throw at you. Rather than innocently slipping through different parts of the floor every couple of minutes, the art of creating specific "tricky bits" to work out and try to understand has well and truly returned and though you'll lose lives on them, you'll at least be accepting of these points as genuine challenges, and that's what gaming is all about after all. I think it's safe to say that there probably won't be a third episode, and I think that's for the best. So as a complete game, which I actually find harder to comprehend than I first thought I would, Sonic 4 is not a perfect attempt at continuing the original series, but no matter how good it could have been, I don't think anyone would really consider it as another proper instalment of those games. They were of a specific time and made for a particularly optimistic and youthful fan-base that has since come to worship them as the untouchable religious icons they are, and there's no real way of just capturing that all over again, because so much has happened since. I don't care what it's name is, this game isn't really Sonic 4 in the way that Sonic 4 always should have been - but that's ok, it doesn't have to be. What it is, is a neat little blast from the past that attempts, mostly successfully, to recapture the important aspects of classic Sonic level design as opposed to modern Sonic level design. It could have been better, but it could also have been much worse. Vaguely, they've got the right idea. And besides, if, five years ago you'd have said that one day we'd be playing a new game where Sonic and Tails chase Eggman and Metal Sonic up to Little Planet, which was being transformed into a new Death Egg, you'd have been laughed out the building (assuming you happened to be in a building full of Sonic fans). This kind of old Sonic lore was almost entirely ignored by SEGA for years, but now it's back and that at least is something to be really happy about. And if you want to see more of it, and more refined classic 2D Sonic gameplay, buy this game, enjoy it, and let them know you're interested, because otherwise we're in danger of losing it all over again. Comments 31 Comments have been posted. I am not sure what I think about this game yet, I'm going to give this game a few more weeks. Great Review, very well constructed. A few things. First, I wish I could just stomp, it would make things easier. In fact I sometimes instinctively stomp, to no evail. I've gatten used to modern sonic. When i was playing Sonic 3 earlier today I felt the same thing. Watch the release trailer, "to be concluded" it says. Also, the Sonic Generations DLC list has supposedly leaked. 4 levels, two classic, two modern. Remember, this is just a rumor, so you can still go back into the comunity, because I myself do not believe it (although it is an ok-ish list). LOL about 100 spelling mistakes in post #2. Oh, and I did post #3. Ah, but I interpreted the "To be Concluded" thing as referring to this episode itself. As kind of a strapline. Just a thought. Did anyone else hear Twinkle Park in White Park Act 2, or was it jus me? IMO the new running animation for Sonic is really cool! In fact, a lot of the Sonic's animations were changed to look really cool. Full Metal Sonic - The Sacred Pink orb that no one knew about except Sega. Hello, LiQuidShade. I sent message to liquidshade@soniczone0.com few months ago. Have you seen it? I'd assume so, because he reads the e-mails I send, even when he doesn't reply. I sent not only that message. Look for 18th February 2012. This message contains 5 images and 1 video. Video is answer to your question how to get the boxes, which are located in a small room without entrance except the bottom hole in Carnival Night Zone. Oh yeah, my mistake, I got that too, sorry. I'll be sure to consider these when I go back over all the content and update it later this year, thanks a lot. Yeah, that's exactly what I'm planning on doing. I've got lots of emails such as those from Bloody Body too, highlighting more stuff, so I will be collating it all at some point - not to worry. I'm going to start with Sonic CD though, the 2011 version introduced a lot of things that need documenting. LiQiudShade, what do you think of the ending and the red rings? I haven't finished collecting all the emeralds yet, but I hear the ending is no different with them. So I thought it was fairly inconclusive, and doesn't really explain whether or not Little Planet actually recovers. If they knew there would be an episode 3 then I can understand that, but as far as I'm aware, they don't, and it all depends on how well this one goes. Haven't done all the red rings yet either - if these extra challenges don't actually unlock anything new then I'm in no hurry to do them. Although before this game I had collected every other red star ring they've come up with, so I guess I should get round to these as well. It's pretty hard to get all the red rings in colours, but not in Generations. I wish generations just scrapped most of the challenges, and had 4 or 6 acts in each zone instead. (probably 4). Because 2 Acts just isn't enough. Well plus, Eggman and Metal Sonic escaped at the end of episode 2. :) I just don't think we're done yet. As some on YT have pointed out, nothing has really been saved yet. We haven't gotten the "all is well" ending. @Mike yeah we have no closure, but due to the reception of this game, I have a strong feeling we won't get episode 3. You also have to realize, if the death egg explodes, wouldn't that mean little planet would destroyed with it? The death egg powers down and I think, since it powered down, it can't be powered back up in time before little planet returns to its original position. Just a theory, take it with a grain of salt and a pinch of pepper. Just heard something from a Sega Representative, but there was a good ending, but it was cut out due to the game being somewhat rushed for release dates. The good ending has the death egg mk II coming apart, piece by piece and exploding, leaving little planet unscathed and letting it teleport away from earth once again. This would've been nice to see, but you can still hear the audio file, just look up the "to be continued" video on youtube and the audio you hear is the death egg breaking apart and exploding, and little planet teleporting away. The "to be continued" screen was meant for the end of episode metal, not episode 2, which could mean this is the end of the Sonic 4 Saga, but at the same time, maybe sega didn't put in the good ending because they may want to continue the saga. I personally, think it should stop here because, to be honest, I am more of a fan of 3D Sonic, and the Sonic 4 Saga isn't really interesting for me, and I think Sega isn't really interested in it either. I think they just want to do something new, instead of continuing the Sonic 4 Saga, and that may be why they are cancelling episode 3 and leaving Sonic 4 where it is. Sorry for the long post, and I wouldn't really say that this is %100 true, but from what I heard from the Representative and a few people at SonicRetro and the SonicStadium and seems that it could be true. Thanks for reading my wall of text, now go outside and play! I just want another sonic games like sonic 1, or sonic adventure 2 to just to give me that feeling of speed and maybe have boost. Wow, you really go all out for these reviews. Do you know when Sonic 4 episode 2 will be released in the U.S. and on what systems you can download it on? And by the way, did you see my last comment on your previous update? How far away is other modes? Oh, and I'm hard at work, hhave I got something in store for you! P.S Have you seen the fan game blue spheres forever. It's epic. Hope you can run it. Will eventually be intergrated into Sonic 3 HD, if THAT ever even gets off the ground! Other Modes is getting closer. I've been on it recently and will be on it this weekend. I'm moving next weekend and won't have internet for a little while so I'll try and get it done before then, but I can't promise anything. No, I had no idea about that Blue Spheres Forever game, it looks awesome! Annoyingly I can't run it on this laptop, it just crashes before it even starts, but I'll try it on my windows emulation on my Mac in a few days. I've only got XP though so that might be the issue. That's I funny, I was thinking recently someone should make an up to date blue spheres game. I envisioned a more original approach, introducing new elements, perhaps breaking out of it being tied solely to a big planet and having Sonic run around connected cylinders and cubes and more complicated shapes, plus coming up with new types of spheres or objects. Still, the fact that this allows you to create your own is awesome, and something I've wanted to do since I was a kid. I can probably dig out some designs I made on graph paper about fifteen years ago, if I looked hard enough. @Chaos Ace - Is it not out already in the US surely? Xbox Arcade, PSN, IOS, Android, etc etc? He's also thinking of making new gimmicks, eg. more different corlous of spheres. Moving Bumpers, Missing Tiles, Teleportation. Mulitplayer. Knuckles gets red spheres, Sonic Gets blue spheres. Get Most blue Spheres. etc. He wants People's Ideas. The Creator is also on the Sonic 3 HD Team. (sonic3hd.com). Don't worry, I can't run it either, on my laptop or desktop. You need microsoft .net framework 4. It's still in beta you know. If you can't run it then he wants you to report it to him, with the error and your tech specs so he can fix it. I contacted the creator of Blue Spheres Forever, and she said that you need open Gl 3.3 si or higher to run it. She gave me a link to a tool which tells you your open Gl Version and if you can run later versions. 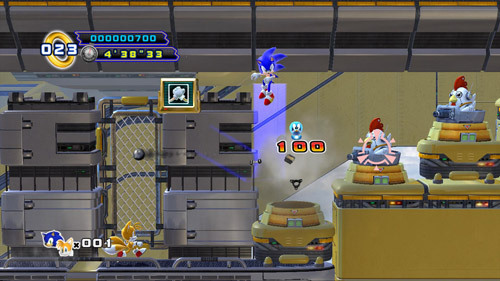 For me, tougher levels on sonic 4 episode II is just a piece of cake. But that's a VERY different story when fighting the final boss of the game. The moustach monkey (a.k.a. Dr. Eggman) is one madman that no-one should mess with, because he delivers the best of his attacks to try and stop sonic and tails, if we players get the timing wrong. Best advice: quick thinking is key to victory, even in a closely pitched battle. And I prefer that no-one uses foul language to describe something that they may have seen before, especially, about wing fortress. It's just a different layout of the level. Many of us prefer originallity to be something special in our lives, versus those who don't believe in originallity at all. I'm a bit of both, but I still live on with the finest moments in the history of Sonic The Hedgehog. He is my most adored superheroe character of all time. In other words, a full 5 star rating. It's really not that necessary to complain about the comments that I've made, today.